"War has its own rules and ruthless logic. In order to fight on equal terms, you in some ways need to imitate your opponent. ... If Moscow carries out an information war against us, then Ukrainian media should forget about objectivity, impartiality, and other democratic norms. ... If Russia brands dissenters with hot irons, we have to tighten the screws and pursue those who ideologically collaborate with the enemy. ... Liberalism and tolerance invite defeat, whereas cruelty gives us a chance to succeed. The truth though, is that this would not only be a victory over Putin, but over our own humanity. ... If Ukraine manages to withstand Russia, how will it differ from it?" 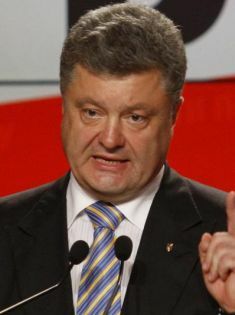 Ukraine's President-elect Petro Poroshenko: Can he successfully walk the tightrope between Russia and Europe with tearing what is left of Ukraine asunder? The first major outbreak of syphilis in Europe at the end of the 15th century is associated with the military campaign of King Charles VIII against Italy. The source of the infection was were the ranks of his enormous army, which was accompanied by a wagon train of prostitutes. The term "French disease" soon entered into wide use. Of course, this was only a convention: the international disease spared no one, from [Borgia] Pope Alexander VI to Holy Roman Emperor Rudolph II. Today we can use as a convention the term the "Russian disease." That Russia has been seriously ill for a very long time is not just lackadaisical speculation. It would be hard to find a country in Europe more infected by intolerance, aggression, militarism and chauvinism. History has come full circle and we've returned to the middle of the last century. Hatred is once again considered a civil duty, cruelty a virtue, despotism a boon, and the seizure of foreign territory something to be celebrated like a national holiday. This virus of hostility has captured the minds millions. It's everywhere - on Russian TV and social networks, in drunken conversations, and official statements Russian Foreign Ministry officials. It infects old and young, rich and poor, the lowest members of society and people who until recently had appeared kind and intelligent. It is used to justify contemptible government action; saber rattling and hatred for all: America, Europe, NATO, Georgia, Ukraine, the Baltic states, Asian immigrants, democrats, liberals, gays, blasphemers and the semi-mythical Banderovtsys [Ukrainian nationalist followers of Stepan Bandera]. [Editor's Note: Stepan Bandera was a Ukrainian politician who took the opportunity of Germany's 1941 invasion of the USSR to push Ukrainians to declare independence. Needless to say, the effort failed, but Bandera continues to be a rallying personality for Ukrainian nationalists. To this day, Russia regards him and his followers to be fascists, since they preferred the Nazis to the Soviets]. Only a small segment of Russian society has stood up to the infection, who are immediately discredited as "national traitors." Carriers of the Russian disease are a serious threat to those around them. Not just because of their inappropriate behavior, but because of the risk of further infection. Having come into contact with Russian aggression, Ukrainians are gradually contracting the ailment of their neighbor. Of all that is happening today, this is perhaps the most lamentable. Until recently, we were quite certain that Ukraine was not Russia. Our society was far better: gentler, more tolerant, more humane. They had Chechnya, Dagestan, Nord-Ost and Beslan; we had 20 years of peace. They had a civil war in the center of Moscow, the storming of the [Russian] White House with tanks, riots in Manezhnaya Square, and pogroms in Kondopoga. We held peaceful rallies and a bloodless Orange Revolution, accompanied by an eternal search for political compromise. They had dictatorship and censorship; we had healthy competition between political parties and free speech. The transition toward the cruelty of the neighboring order on Ukrainian soil seems somehow unreal. But as it turns out, slipping to the level of Russia isn’t that hard. The first symptoms of the disease of our neighbor appeared in Ukraine several years ago, but at first it only affected the political elite. In 2011, we had our own version of the Khodorkovsky case: [like Putin], the president of Ukraine got rid of his rival and threw the former prime minister into jail [Yulia Tymoshenko]. Nothing like that had ever happened in Ukrainian politics, although at that point many had yet to realize that the old order was doomed. For a long time we held out hope for some healing European intervention, but no improvement was forthcoming. On November 30, 2013, the Russian disease spilled into the streets: peaceful demonstrators in Ukraine had never before been dispersed with such brutality. The infection spread quickly and resulted in the beating and abduction of local activists fighting the Bekruts [special police] on Grushevskiy Street, and the cold-blooded executions of insurgents on Institutskaya Street. And then came the real hot spots of infection, with incidents of hostage taking, the torture of prisoners, anti-terrorist operations with dozens of victims, mutual damnation, cursing and spell casting, and belligerent cries in the militant spirit of Putin: "We'll flush you down the toilet!" 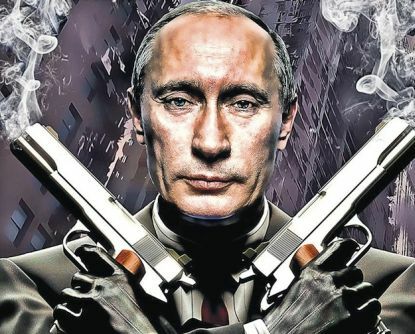 Yes, Vladimir Vladimirovich Putin has put great effort into infecting Ukraine, and the main carriers of the Russian disease have become pro-Russian forces. But the patriotic public of Ukraine that opposes the Kremlin has also contracted the disease. Despite our hopes, the rejection of Russian despotism and militarism is no protection from the infection. The level of bitterness toward "Colorados (pro-Russia activists)" is growing in direct proportion to the hatred for "Banderovtsys." On May 2, the killings of their fellow citizens at an Odessa trade union center inspired many Ukrainians: the dead victims were no longer considered people, only enemies. This is a typical reaction for a Russian resident who exults over the death of enemies in Chechnya, Georgia, or the World Trade Center in New York. Today’s Ukraine is divided into activists with yellow and blue flags, and those with the ribbon of St. George (symbol of Russian nationalism). We are divided into patriots and criminals, separatists and defenders of territorial integrity. But there is a much more profound mental rift that is breaking our society into two: Those who rejoice at seeing enemy corpses - because they are the enemy; and those who cannot rejoice, because there are corpses. So we have been struck with wave of the Russian disease, although not everyone is aware of it. So far we have been immune to the second wave. But for how long? Unfortunately, war has its own rules and ruthless logic. In order to fight on equal terms, you in some ways need to imitate your opponent. "Evil begets evil"; "An eye for an eye, a tooth for a tooth"; "If your enemy doesn’t surrender, destroy him"; these aren't just a set of abstract maxims, but part of our everyday lives. If the separatists kidnap and torture people, rip open the stomachs of prisoners, or beat and kill pro-Ukraine demonstrators, then one cannot stand on ceremony and show them humanity. If, helped by Dmitriy Kiselev, Moscow carries out a full-scale information war against us, then Ukrainian media should forget about objectivity, impartiality, and other democratic norms. If Russia puts up a united front by branding dissenters with hot irons, then it means we have to tighten the screws and pursue those who ideologically collaborate with the enemy. Liberalism and tolerance invites defeat, whereas cruelty gives us a chance to succeed. The truth though, is that this would not only be a victory over Putin, but over our own humanity. Can Ukraine survive the Russian onslaught? Today, this is the question burning in the minds of millions of our compatriots. But isn’t it time to ask another, no less pressing question: If Ukraine manages to withstand Russia, how will it differ from it?